This one-pan side dish is a healthy take on the traditional baked green bean casserole. 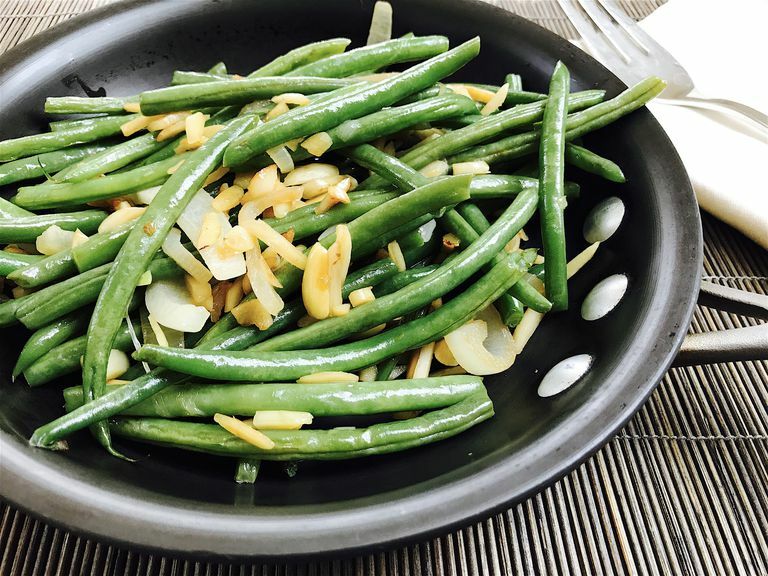 The green beans contribute a serving of vegetables. According to MIND diet studies, that'll help protect against cognitive decline and help your brain function up to 1½ years younger! Tossing in slivered almonds adds in healthy fats, vitamin E, and calcium. These help reduce oxidative stress and inflammation. They also fuel your brain and body with fiber, folate, and flavonoids. This translates to slowing down cognitive decline and increasing longevity in the long term. The garlic and onions in this dish also save the brain from cognitive decline—after all, what’s good for your heart is good for your brain health, too. In a medium saute pan over medium-low heat, add oil and garlic. Saute for a minute. Add onions and saute for another minute until onions become translucent and slightly browned around the edges. Toss in the green beans. Mix, cover, and allow to cook for a few minutes. Stir occasionally and allow to cook and steam under the cover for a few more minutes. Add lemon juice, almonds, and salt and mix while cooking. Saute until green beans begin to soften. Remove from heat. Toss and portion into serving bowls or plates. Spice up this dish with jalapenos, sriracha, or add smoky flavor with smoked paprika. If you like your meals creamy, add up to a quarter cup of whole milk. Saute some white button mushrooms or baby bellas along with the green beans for an additional serving of veggies. Use a smaller, more delicate variety of green beans called haricot verts for a more sophisticated presentation. They are slimmer and will take less time to cook. Be sure to cook the green beans until soft, but not overly soft or mushy. Before serving, toss well to ensure that each serving contains some of the garlic, onion, and almond mixture. If you’d rather roast in the oven, simply put all of the ingredients into an oven-safe bowl and put into a 400 degree oven for 40 minutes. Mix every 10 to 15 minutes. Serve immediately with grilled or baked chicken breast, fish, or tofu on the side.